NissanConnect SM combines navigation, security, entertainment and ways to stay in touch in a single dash-mounted system designed to reduce distractions. It helps make every drive effortless, points you where you need to go, and keeps you connected the whole way there. With its suite of digital alerts and remote access features, available across three packages, NissanConnect SM Services powered by SiriusXM® is your direct link to personal security, convenience, and confidence. Hit the talk button on your steering wheel to activate voice recognition and control your NissanConnectSM system with simple voice commands. Access your apps, music, phone contacts, maps and more from a convenient color touchscreen display. It’s all right there at your fingertips. Get help when you need it most with emergency response services, manage your vehicle with remote access features, and stay on top of maintenance with vehicle health reports and service reminders. Get all that jazz, country, rock, pop, and more. 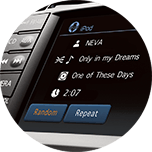 With Bluetooth® streaming audio, and commercial-free SiriusXM® Satellite Radio, there is something for everyone. When equipped with navigation, NissanConnectSM can help you find local hotspots using Google®, guide you to your destination with built-in maps, and help you move through the city with ease thanks to SiriusXM® Traffic. With apps like Facebook® and Twitter, plus advanced voice recognition technology that lets you send a text or make a call without picking up your phone, keeping up with your connections has never been so easy. Choose a NissanConnectSM option package that's equipped with Mobile Apps and take your digital life in the fast lane. In a Nissan equipped with SiriusXM®, get a 3-month trial subscription with coast-to-coast satellite radio coverage. If your vehicle features navigation you'll also have access to SiriusXM® Traffic, which includes detailed traffic and more.